As far as pre-draft NFL products go, 2011 Upper Deck Football is as good as it gets. When Upper Deck lost their NFL license prior to the 2010 football card season, collectors wondered what impact it would have on the collecting world. In short, it forced Upper Deck to go in a different direction and make full use of their recently acquired NCAA license. This has created a more diverse marketplace and in the case of 2011 Upper Deck Football, a high-quality pre-draft football card offering that should hold up fairly well in terms of long-term value. As with almost every base Upper Deck product, the focus is less on card design and more on set photography. From Mike Singletary's eyes to rarely seen pictures of Jerry Rice in a Mississippi Valley State uniform, 2011 Upper Deck Football features some extremely cool college football photography. 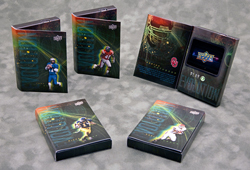 The 1991 Upper Deck Football 20th Anniversary parallels are spot on and extremely collectible (10 per box). They feature a slight boost of gloss when compared to the 20th Anniversary parallels that were seeded in 2010-11 Upper Deck Series 1 & 2 Hockey. Another great thing is that each card back features a player's complete collegiate stat (rookies and legends). For stat junkies who have memorized every currently available NFL stat, this offers a glimpse into a less publicized set of statistics. The base set features an expansive 200 card look at the upcoming crop of NFL rookies. A seemless combination of rookies both big and small offer collectors a deep look at the upcoming NFL draft class. There's life beyond Cam Newton and co. when compared to products like 2011 Leaf Metal Draft. The biggest beef I had with the checklist was how short the legends checklist was (50) and the complete absence of current NFL veterans outside of Evolution's brief CL. This led to more doubles than should be permissible in a box break. That being said, 2011 Upper Deck Football is about the upcoming rookie class and from the base set to the autograph set list, it delivers. The history of pre-draft football cards is littered with cautionary tales and worthless cards. 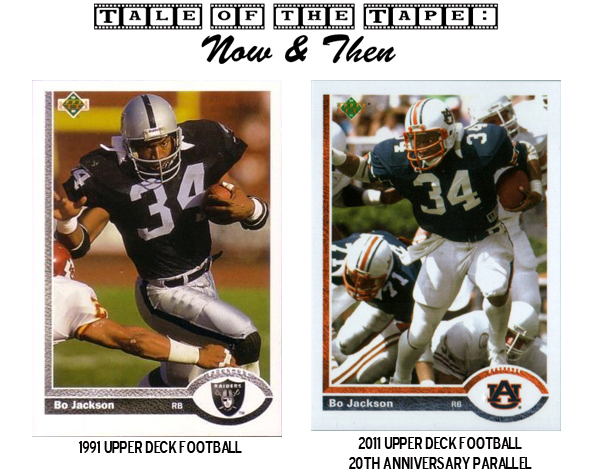 2011 Upper Deck Football isn't likely to become one of those cautionary tales, as it features a full-fledge NCAA license and a well established brand name. From SPx to SP Authentic to Exquisite, Upper Deck's first season with the NCAA was a resounding success in the secondary market. With these products, Upper Deck tapped into a dual market that includes both college and pro football fans. There's no reason to believe this won't be the case again this year. The biggest let down has been the performance of Upper Deck's highly touted "Evolution" on eBay. The industry's first ever video trading cards haven't been well received by those who have gotten their hands on one and eBay sales suggest that their assertion is spot on. While big time hits from 2011 Upper Deck aren't doing as well as many expected in the secondary market, this is off-set by the product's depth which includes the highly collectible short print base rookies and 20th Anniversary parallels. Overall, 3 guaranteed hits and 10 20th Anniversary parallels for around $100 per box is an extremely sound deal. For my money, this might be the best pre-draft football card offering yet. A few weeks back I did a 2011 Leaf Metal Draft review stating that it was one of the best pre-draft football products I've ever opened. Well, that's no longer the case, as 2011 Upper Deck Football features an NCAA license and offers collectors a much deeper look at the 2011 rookie class. The only real complaint I have pertains to the absence of veterans in the product. I could be wrong, but outside of the Evolution video cards, there isn't a single current NFL veteran in the product. 2011 has been the first year I haven't gone out of my way to avoid eye contact with a pre-draft football box thanks to products like 2011 Leaf Metal Draft and 2011 Upper Deck Football. 2011 Upper Deck College Bowl Game Heroes Doug Flute Auto BGS 9.5 5 Sic Rare!